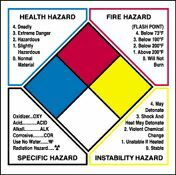 Title: 05/21/1987 - HMIS use in meeting the in-plant labeling requirements of the HCS. 1500 Rhode Island Avenue, N. W.
This is in response to your letter of April 21 regarding the acceptability of the National Paint and Coatings Association's Hazardous Materials Information System (HMIS) for use in meeting the in-plant labeling requirements of the Hazard Communication Standard. As you mention in your letter, page A-11 of Occupational Safety and Health Administration Instruction CPL 2-2.38A CH-1 states that "the intent of the standard is to permit the use of (numerical labeling systems) as long as the entire Hazard Communication Program is effective." Therefore, the use of the HMIS would be acceptable in meeting the in-plant labeling requirements of the standard. Of course, the system's user would need to correctly use the system (apply the correct numerical ratings) to be found in compliance. In the case of shipped containers, a label must include the target organ effects. This information may be part of an additional label or added to the HMIS label. Also, in the case of shipped containers, the label must include the name and address of the chemical manufacturer, importer, or other responsible party.